I spend a lot of time reading and thinking and talking about happiness. People sometimes question the value of what might seem to be a self-centered pursuit. How can we focus on happiness when there is so much suffering in the world? Indeed, how can caring people turn their backs on hunger and disease and violence and poverty to seek inner peace and contentment? How dare we close our eyes to the ugliness and terror in the world and go about with hearts full of joy? Is that what happiness is? Massive denial and self-delusion? A heart hardened to the reality of pain? The refuge of fools and princes? I’m going to go out on a limb here and make a radical statement. I believe that the most generous, selfless, precious gift we can give the world is to awaken our natural state of calm, abiding joy. It’s always there, just a breath away. It’s where we came from. It’s our home. We don’t need to kindle a light. It already burns brightly. It always has and always will. If we remove whatever blocks its light, it will shine forth in the darkness. And oh, how much darkness there is these days. I just finished an historical novel about the war in Biafra. I remember the photos of the starving children with swollen bellies from that time. We see the same faces and swollen bellies of children starving today in so many places, while war and violence spread across borders and through neighborhoods. Fear continues to infect American politics, fear that arrived on airplanes and has spread like cancer ever since. Newsweek magazine features Chinese women billionaires on its cover, while Tibetan dissidents are jailed. Children are killing children in schools. The weight of despair threatens to crush us all. We want to make things better, but how? Not by doing more of the same. One definition of insanity is doing the same thing over and over, thinking you will get a different result. Doing more of the same is what blocks our light. Buddha recognized that Hatred never ceases by hatred, but by love alone is healed. Gandhi exhorted us all to be the change we want to see. What change do we want to see? A world that is safe? Then be safe. A world that is kind? Then be kind. A world that is not driven by fear? Then fear not. A world permeated with joy? Then be joyful. A world no longer shrouded in darkness? Then be light. One of the lessons in A Course in Miracles says “I am the light of the world.” Although that might sound arrogant, the Course explains that this is not a statement of the ego, but a humble acknowledgment of the purpose we all share – to shower fear with love, to soothe hatred with compassion, to comfort despair with joy. From one candle burning bright, a thousand candles can be lit. Related posts: Put Your Oxygen Mask On First; Look Out...It’s Contagious! So very well said Galen Pearl. Being happy does not mean forgetting the world around. Being Joy, Happiness, Love, Kindness, Peace is sending a positive message to the world. Every change can only start within us. I even think it is our duty to find this place within us so we can then go out and help others. I did things the other way around for years and it did not work, it could not work. May we stand up and shine! Take care. Marie, I appreciate your reflection on how you used to do things differently and how that didn't work. It seems counterintuitive to focus on ourselves first, but when we realize that our inner self is really the best we have to offer, then it makes sense. "I’m going to go out on a limb here and make a radical statement. I believe that the most generous, selfless, precious gift we can give the world is to awaken our natural state of calm, abiding joy. It’s always there, just a breath away. It’s where we came from. It’s our home. We don’t need to kindle a light. It already burns brightly. It always has and always will. If we remove whatever blocks its light, it will shine forth in the darkness." Carolyn, Glad you liked it. Hope you have had a great day. I agree too. My lingering in sadness does not feed one extra person in Africa or provide water for one thirsty child. If it did, I'd just go be sad! Finding the joy tends to spread it. I'd rather spread joy thru my house and street and world than add to its sadness. Sandra, True, we are always adding something, some energy to the world. Better that it's joy rather than sadness. When you put it that way, we can see that it really does matter. Karen, Interesting observation about FB. I really don't use it and I've just put the blog on FB--still trying to figure that out. Anger is reflected in a lot of blogs I visit, too. I tend not to go back to those very much, especially if it is really a lot of ranting. Where is all this anger coming from?? You've got me thinking! I think there is a difference between being happy and sharing that with others, and having your head in the sand about the atrocities that are surrounding us. I try very hard every single day to find some type of beauty in the world, and mostly, I put a lot of effort into being kind and understanding, in the hopes that the part of the world that surrounds me is bit of a better place. I can only hope that someone's happiness and joyfulness rubs off onto me, it would only make my day better! Great post Galen! Tracy, Yes, there is a difference. You explained it very well. I know you have a lot of joy and humor to share--your blog always makes me laugh! Galen: I am a Jung fan. Good quote. Have you read Achebe's book, Things Fall Apart? JJ,I have not read that book, but I'm going to check it out right now. 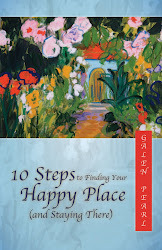 The title is similar to one of my favorite Pema Chodron books, When Things Fall Apart. Thanks. It kind of blows my mind to think that finding happiness and joy in oneself could be considered selfish or wrong. Actually if you CANNOT do that (in spite of external circumstances) you are in deep trouble and so is everyone else because we're all connected. I should know, I just spent the better part of a couple of years training myself out of that mindset. It is from a place of love (or you could substitute happiness here, really) that the whole world will heal. It won't heal by hate, that's for sure, and it won't heal by us feeling sorry or sad for other people or ourselves...then we are useless to bring change. Love ripples out and allows us to treat others with kindness and take action to better the world. Just bettering ourseleves betters the world. Julie, It is hard to believe, but I led a retreat where this shadow belief emerged. I think it surprised all of us, but then we spent some time looking at it more deeply. I think some of us have these beliefs down deep and are not even aware of them. Thanks for your comment. Very nice post Galen and thoughtful insights. Love, love, love this article - I'm with you my friend - I just finished watching a video on this solar flare stuff and can be scary but I had to remind myself that we don't know the hour of when who is greater than us will come. So we must stay in love, in peace and in happiness for that is what I surround myself with. Thank you for this wonderful reminder of JOY and LOVE which equals to HAPPINESS! Nancy, I love, love, love your comments. You are always so positive and upbeat. Jean, Well said. We get what we focus on. Thanks for commenting. I haven't much to add, but I'm with the rest. You found a way of saying something I innately knew to be true, but haven't articulated as well as this. As long as I'm not in physical distress from hunger or a cold or lack of sleep, I'm happy. Maybe I re-learned it after unexpected diversions. Whatever, I'm glad to be back in balance. Problems arrive in front of me that need attention. Mikey, You always add something by just bringing your awesome self to the table. Thanks for the kind words. My signature on all my emails is: Peace begins with each of us, as individuals. The ability to bring about peace is indeed in each one of us as Carolyn stated. One by one... joining together. It is similar to the Random Acts of Kindness that hopefully multiply. Unfortunately the ugly head of power and greed grab the souls of certain individuals and they do their own spreading... through fear, poverty. Those that stand up to them are struck down. This first hit me as a teen, during the Hungarian Revolution. I could not understand such action at that time and I do not understand now. When I went to a Unity church years ago, we often sang a song that included the line "Let there be peace on earth, and let it begin with me." That's the true beginning of peace, isn't it? This was a very timely and inspiring post. I will ponder on the thoughts. I think that taking the Savior's admonition of Love one another as He has loved you would go a long ways in maintaining happiness and at the same time spreading the light. Always a delight to read your thought; blessings to you! LeAnn, No kidding. We really can't come up with a better guideline than that. You did good Galen. We are the light and one candle will light can light up a thousand candles and those those can each light up another thousand. There will always be sin in the world, but when we find the happiness we are grateful for what we do have and with that we love and know how to share with others. Happiness is not taken away from others, but having an open heart and knowing how to love others, and be there if and when we can help. Happiness makes for positive people, not negative. The more positive people we have the less negative people there will be. thanks again for more inspiration. Debbie, Well said. Our happiness does not take happiness from anyone. On the contrary, it adds happiness to the world. Thanks for your comment. Oh I do like these words today..Thank you so much for sharing. Patricia, I found that quote at the beginning of a book by a Buddhist monk. As for that fear of shining our light, yes we all experience that now and then. But we hide our light from ourselves when we hide it from others. So shine forth! I love the idea of awakening our natural state of calm and joy. Great post! I just tweeted it. Alida, Thank you! That's the first time I've been tweeted, at least the first time I know about. I just got a Facebook page. I guess Twitter is next. You're way ahead of me! Beautifully said, Galen. Being happy when those around you are not is difficult. It can be misinterpreted as being insensitive to others, But, like one person yawning will cause others to do the same, being happy can help those around us to see there is another way to respond. We can be unhappy at the evil and unfairness in the world but still not allow that to affect our attitude toward those we interact with on a daily basis. A smile and a kind word can undo a lot of hurt. Bob, Great analogy to yawning. I yawned just as I wrote that--ha! And yes, a simple smile and a kind word can work miracles. Thanks for commenting. Wonderfully written Galen. You are so right about having our calm away just a breath away. It is knowing how to find it at times that gets me. :) Calm with 3 young kids isn't easy but I take what I can. Even if it is just stepping out on the patio with a hot cup of tea for 5 minutes just to listen to the birds chirp. For me, my calm is in my relationship with God. Love this. Thank you! Kristin, I hear you! I remember all the noise in the house with young kids running around. I loved going in their rooms to look at them after they went to sleep, that quiet evening time. And I would get up early so that I could have a little time to myself before it all started over again. Thanks for commenting. Galen I have a few ways to view this; 1. I can't give away something I do not first possess; 2. if I'm not selfish and look after myself first, what good am I to others? I have to be healthy and happy to share my love with others. Excellent post, thank you for the refresher. Cheers. I hope you have a fantastic weekend! darlin, So wise on both counts. I'm going to pop over to your blog now and catch up on your adventure. So beautiful! I agree fully, when we find our own happiness the barriers between ourselves and others start to melt. That's when kindness and compassion really begin. May light dissolve the darkness everywhere it exists! Sandra, Thanks for the lovely and inspiring aspiration. I believe that each of us have our unique roles to play in this world. Some of us have the power and the influence to make changes to the world on a large scale. Others have much less power and influence so they should focus on what they can do instead of what they can't. If all of us did our part to make the world a better place, I believe that our efforts will all add up. Your role is probably to help people to find happiness since this is something you think about so often. I think about choices and the bigger picture obsessively so that is my role to play, probably as a guide to others. Still, before we can help anyone, we must set our lives in order. If we cannot survive or if we are not happy and joyful, there is no way we can provide any meaningful help. Thank you for sharing this thought provoking article! Irving, How interesting to think about our unique roles. If my role is to help people find happiness, then that brings me much happiness! Thanks for liking my page on Facebook. I'm still trying to figure out that all that means--ha! This is an interesting post. I too believe that there is light always before us, but it is we ourselves who place blocks or blindness and fog around us that take many forms in self-worth, beliefs, attitudes and /or dishonesty all of which keep us from seeing it. Where we can simplify, we complicate. I sigh... it's always easier said than done and always realized upon hindsight than in foresight. BM, Where we can simplify, we complicate--an insightful observation! I know that is often true for me. And yet, as I go along, I find that indeed things are much simpler than I used to think. Dia, Educating people about these things is indeed the best thing we can do. And the best way to do that is to manifest these things in our own lives. Thanks for commenting. "humble acknowledgment of the purpose we all share – to shower fear with love, to soothe hatred with compassion, to comfort ..." I love this: for we all have a purpose here on earth.